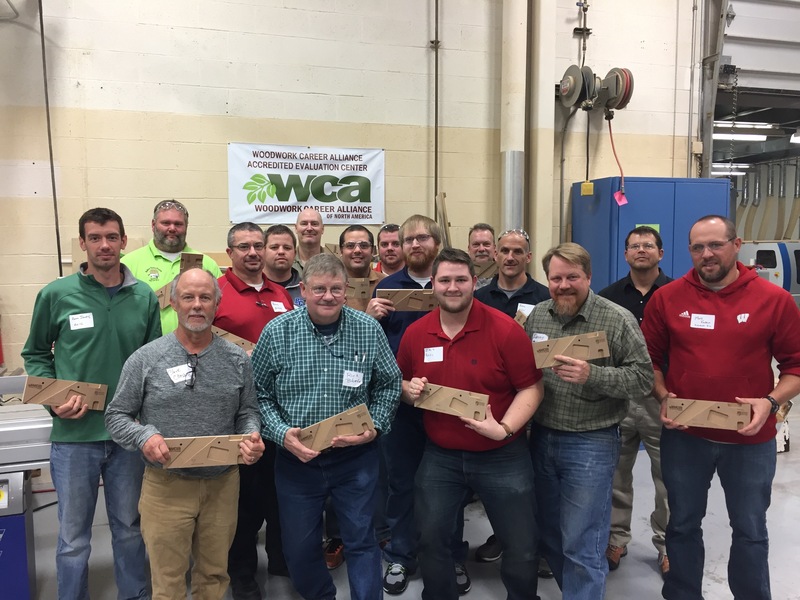 MADISON, Wis. -- Wisconsin once again leads the nation in accredited skill evaluators following a sold-out Woodwork Career Alliance (WCA) Accredited Skill Evaluator training program held October 28 at Madison Area Technical College. The training of 16 new evaluators capped off a full-day event that also included a woodworking teacher in-service program at Madison College’s cabinetmaking instruction facility. Accredited skill evaluators are responsible for assessing and awarding skill stamps to woodworkers participating in the WCA’s Passport credential program. Patrick Molzahn, director of Madison College’s Cabinetmaking & Millwork program and a WCA chief evaluator, presided over the evaluator training. Madison College was the site of the first-ever WCA evaluator training in 2011 and has held at least one training session every year since. Molzahn has personally trained more than 75 evaluators for the WCA. “I am excited to add 16 new evaluators to our list, and even more excited that Wisconsin has re-taken the lead over California as having the largest number of WCA certified evaluators in North America,” Molzahn said. The morning in-service program was attended by 23 teachers. While the majority were from Illinois and Wisconsin, one teacher came from Wyoming and an industry member travelled from Florida to attend the event. The in-service program featured five speakers. Molzahn shared a number of training resources, including several new videos developed as part of Madison College’s self-directed curriculum initiative. Bert Christensen of Westochia High School demonstrated how his students use video to document their WCA evaluations. Dan Hertel of Deforest High School showed how he teaches students to use portable power saws. Dennis Mossholder of Madison East High School shared how he teaches layout and implements specific layout concepts into student projects. Mark Smith of Reed-Custer High School discussed how he promotes his woodworking program and how his students create electronic portfolios of their work. The WCA provided lunch and Bessey Tools North America provided door prizes for the event. Six lucky winners went home with Bessey clamps. Each participant left with their own customized measurement widget which they can use to evaluate their students. Molzahn noted that Wisconsin teachers have an even greater incentive to certify their students. The WCA credential was recently recognized by the Wisconsin Department of Workforce Development as eligible for Act 59 funding. High schools in the state can now receive up to $1,000 per student for every credential awarded. For more information about the event, contact Patrick Molzahn at 608-246-6842 or pmolzahn@madisoncollege.edu.